Cogni-PS promotes brain function by helping maintain neuronal membrane fluidity (cell to cell communication), which is essential for cognition, mental performance, attentiveness and reaction time. 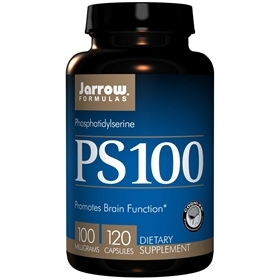 PS protects against stress, reducing the action of cortisol (catabolic stress hormone). Cogni-PS is a concentrated form of phosphatidylserine derived from soy phospholipids and offers superior stability. Take 1 capsule up to 3 times per day with a meal or as directed by your qualified health care consultant. Best kept refrigerated. Cellulose, silicon dioxide, magnesium stearate (vegetable source) and gamma tocopherol. Capsule consists of gelatin. Contains: Soy. No wheat, no gluten, no dairy, no egg, no fish/shellfish, no peanuts/tree nuts.